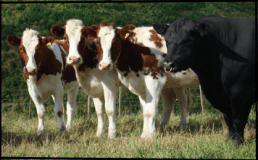 Lifestylers traditionally buy dairy-cross calves to raise for home-kill meat. These are usually Jersey or Freisan crossed with Hereford or Angus. These tend to take a long time to be ‘finished’ as they continue to grow taller for several years, putting energy into their skeleton and not into muscle growth. 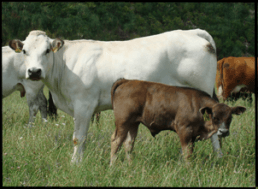 A beef animal is prime when it begins to lay down fat in muscle and subcutaneous areas. Lowline cross animals mature faster than other breeds. At Rancho Radiata we have been crossing our Lowline bulls with cows of numerous different breeds for over 10 years. Although we know that Lowlines cross well with dairy breeds such as Jersey and Freisan, we have been interested only in the production of premium beef, so have concentrated on crossbreeding with either beef breeds or all-purpose breeds. 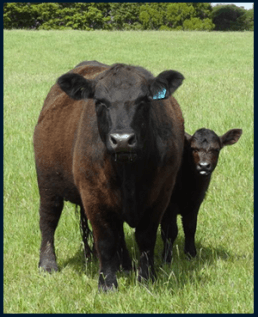 We have found that a tall slow maturing beef cow, when mated with a Lowline bull will produce a medium-sized beef animal that retains many of the characteristics of a Lowline i.e. fast-maturing with tender flavoursome meat. Lowline sired steers and heifers were ‘finished’ and ready for slaughter between 16-22 months. Body weights range from 375-450 kg. Heifers are at the lighter end of the scale but reach the 180kg requirement of commercial carcases., Lowlines crossed with smaller breeds, or cattle that are 75% Lowline, are smaller than this and very suitable for lifestylers and home kill beef. Although we no longer sell crossbred animals it is a cost effective alternative for Lifestylers to lease or buy a Lowine Bull. This allows you to decrease the size of your animals with less pugging and increased ease of handling. We have previously crossbred Lowlines bulls with MRI (red and white Dutch cows), Angus / MRI, Charolais / Lowline, Piedmontese (Italian cows) and Belted Galloways. The white belts remain intact in the crossbred Galloway calves but tend to be thinner than seen on their mothers. These calves are especially popular. 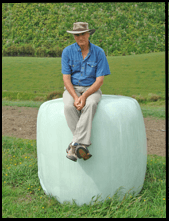 Lifestylers with a larger block are often happy to buy an easy to handle Lowline bull to keep for their own use, and often the use of their neighbours, over a number of years. This is also a good option if you are not close enough for us to deliver lease bulls. Lifestylers in the Rodney area who have small numbers of heifers and cows often prefer to lease a yearling bull. We deliver the bull and pick him up 8 – 12 weeks later as suits you. Contact Us to view our selection of small easily handled purebred Lowlines.